Laser cutting is a technology that uses a high power laser to cut materials in industrial manufacturing applications. Laser cutting works by directing the output of a high-power laser via a computer, at the material to be cut. The material is then melted, burned, vaporized away, or is blown away by a jet of gas, leaving an edge with a high-quality surface finish. 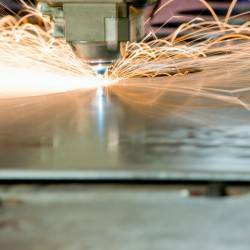 Our Industrial laser cutters are used to cut flat-sheet material as well as structural and piping materials. At AH Stock Manufacturing Corp., we offer our customers a solution to all of their manufacturing needs, from engineering to finished products. In addition our Mitsubishi LVP3015 laser cutter is the latest in laser cutting technology giving us a 4000 watt laser capacity complete with 64 bit CNC Controls. Call us today at 920.726.4211 to speak to one of our friendly and knowledgeable sales professionals.